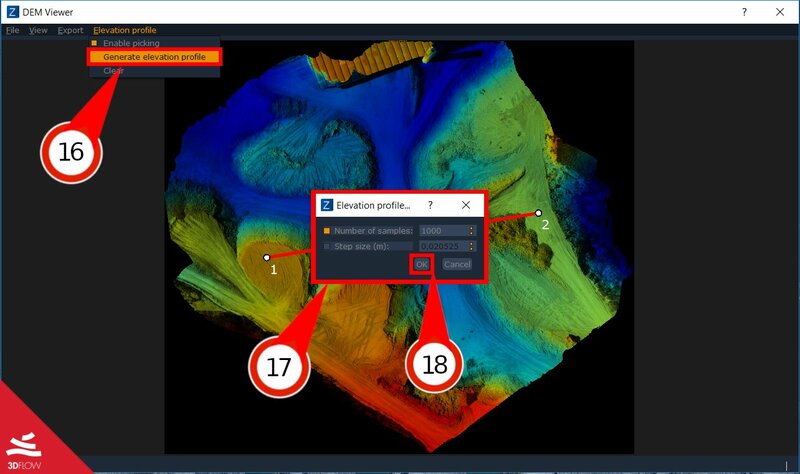 In the following tutorial, we will learn how to get a DEM – digital elevation model– and to draw profiles starting from that. These tools are available for 3DF Zephyr Pro and Aerial versions only. For this tutorial, you can use any dataset you’d like. We are going to use the public dataset linked just below. 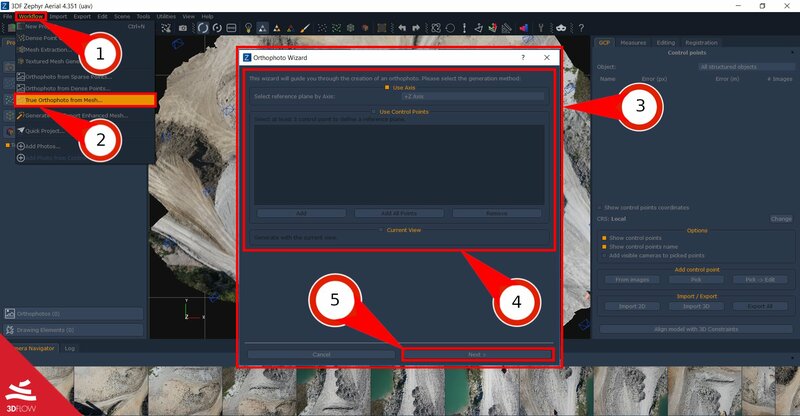 This step is similar to “Orthophoto generation Tutorial” as you are supposed to generate an orthophoto before running DEM generation, so click on Workflow (1), then on “True Orthophoto from Mesh” (2). 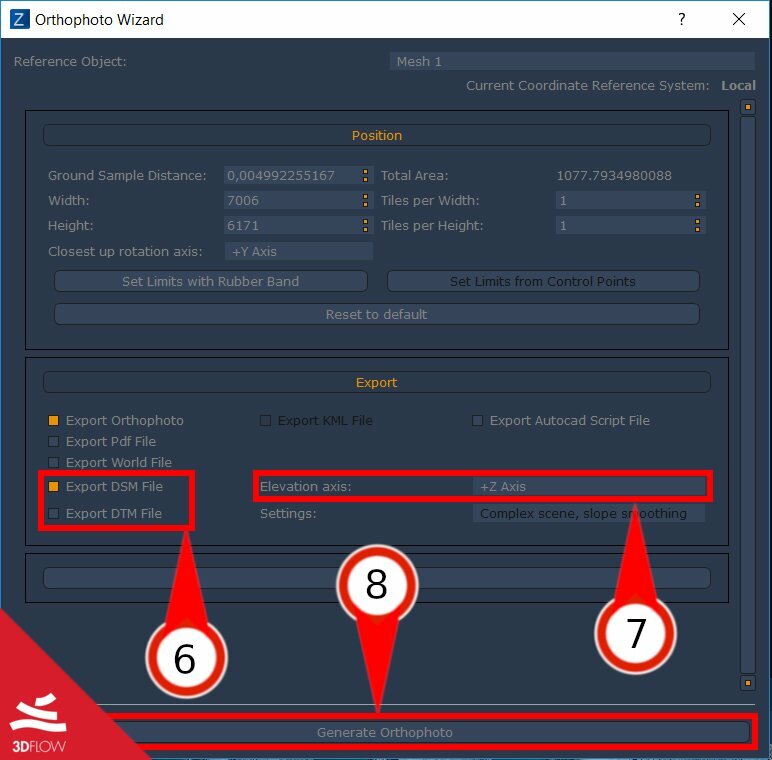 In the “Orthophoto wizard” panel (3) you are allowed to choose if either exploiting control points or axis method (4), then just click on “Next” (5) button. 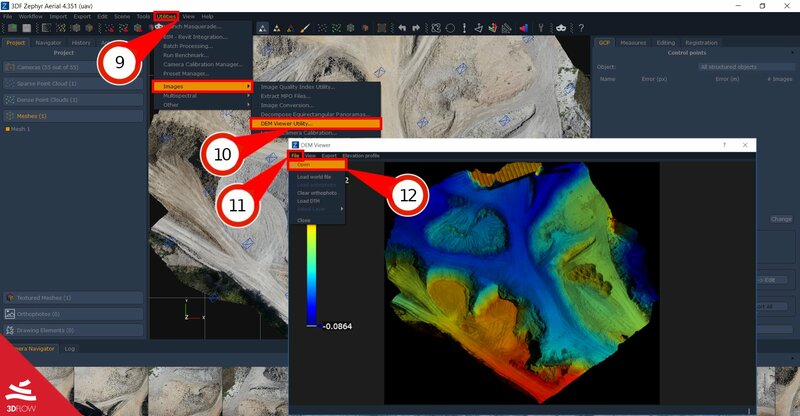 Afterwards, check the Export section into the orthophoto settings window and activate the “Export DSM File” or “Export DTM File” option (6) (see image below). You have to specify also the “Elevation Axis” (7) and, when you are ready, click to “Generate Orthophoto” (8) button. After clicking on Generate orthophoto button simply choose a file name and format as well as the file destination. As soon as the computation is completed the DEM viewer will appear automatically. It allows seeing the DEM you have just created directly inside 3DF Zephyr (see image below). In the DEM Viewer, it is also possible to run a Profile generation in order to draw one or more polylines directly on DEM and getting than their altimetric profile. 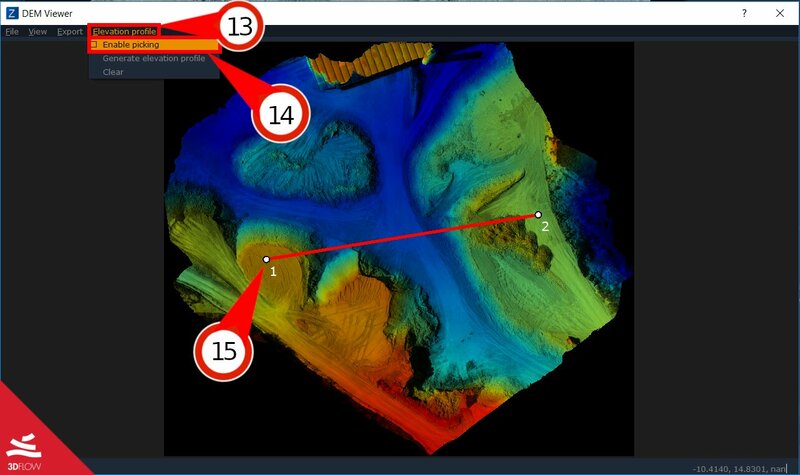 To to draw a polyline on DEM you simply click on “Elevation Profile” (13) and select “Enable Picking” (14) in the DEM viewer window. By drawing one or more polylines on DEM you will notice that each vertex will be identified by a number (see image below) (15). Once all polyline vertices are placed you can click again on “Elevation Profile” (13) and now on “Generate Elevation Profile” (16). 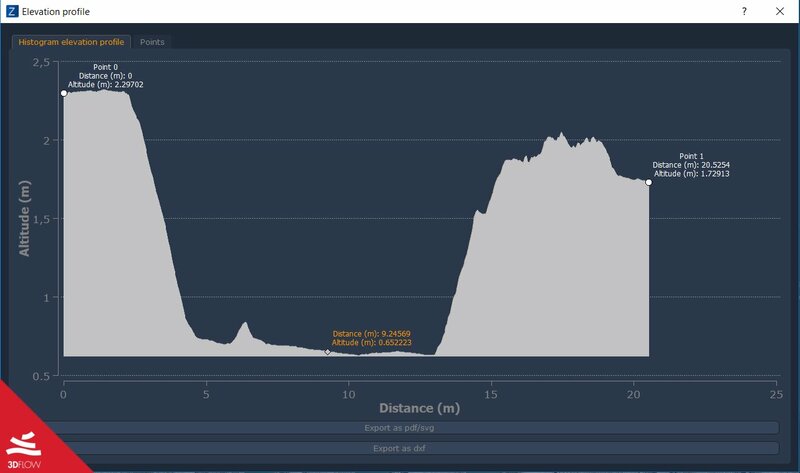 The “Elevation Profile Sampling Selection” windows will show and allows you to tune some parameters before computing the elevation profile histogram. The “Elevation Profile” windows will appear and in there you can find the tab “Histogram elevation profile”, where you can see the altimetric profile of the polyline and the tab “Points” as well, where each vertex of the polyline is listed, (see image below). Moreover, by moving the cursor you can see the quote of every single profile point in detail. You can also export a profile (pdf format) by clicking on Export as pdf/svg or dxf. The next tutorial will explain the coded target generation and automatic detection. Click here to proceed to the next tutorial.